Some food memories are more about location than they are about a specific entrée or dining event. The Cow Bay Café in Prince Rupert, British Columbia, Canada fits that description. Years ago we enjoyed a celebration dinner there, memorable for actually being in port to dine out on a birthday or anniversary date as well as for a curry dish of some sort that was both unusual and delicious. Cruising friend Margie O. reported the café was closed but owner Adrienne Johnston had published a cookbook, and I knew I needed to revisit that food memory via the book “no more secrets: recipes from cow bay café”. Margie delivered a copy to the boat (thank you, girlfriend!) and we’re all set to cook together from the book each month, taking turns choosing which recipe to prepare. She had already tried the watermelon salad so that's the first choice. Ooh, it was gorgeous! 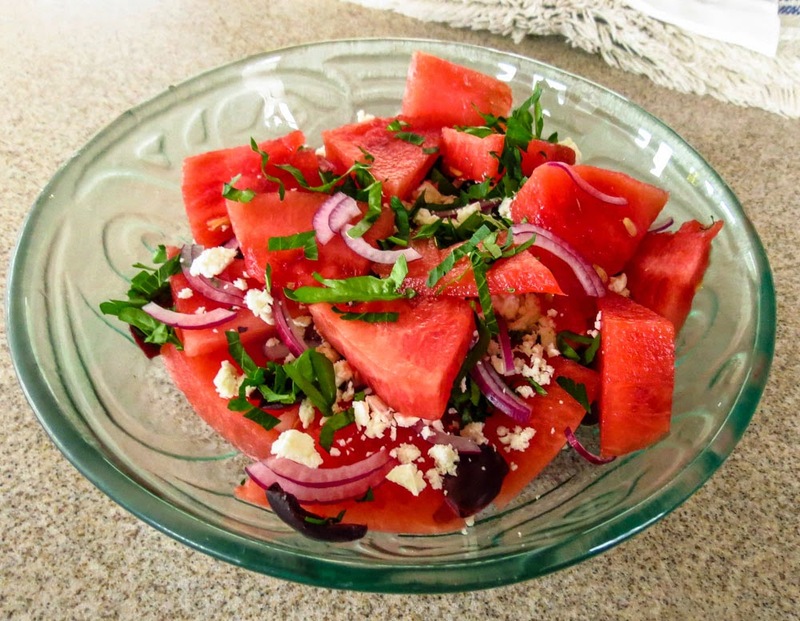 How could it miss with the eye-catching red of the watermelon offering a beautiful base for the contrasting creamy white feta, fresh green parsley and purple-black olives? The actual taste was a surprise… but not in a good way. The original recipe called for sun-dried black Moroccan olives, a missing ingredient in the boat pantry. I substituted Kalamata olives, not a good choice since even after rinsing they were too assertive to use in this dish. Salty olive was the only flavor our taste buds registered. Brother Mike suggested substituting dried cranberries, the Capt suggested fresh cherries, and I’m still thinking about a less-salty something other than fruit. Drat! That was one gorgeous plate of red that I was prepared to love. It’s good I only made a half-recipe, that left us the rest of the small watermelon to enjoy for dessert. The Capt. loves watermelon by itself, I prefer it with a drizzle of balsamic vinegar. Either way watermelon means summer and we're ready to enjoy watermelon for breakfast, lunch, dinner or snack - watermelon any time. Bring on the watermelon, but hold the olives. Whisk together the dressing ingredients ahead of time and let the mix chill in the fridge to blend flavors. 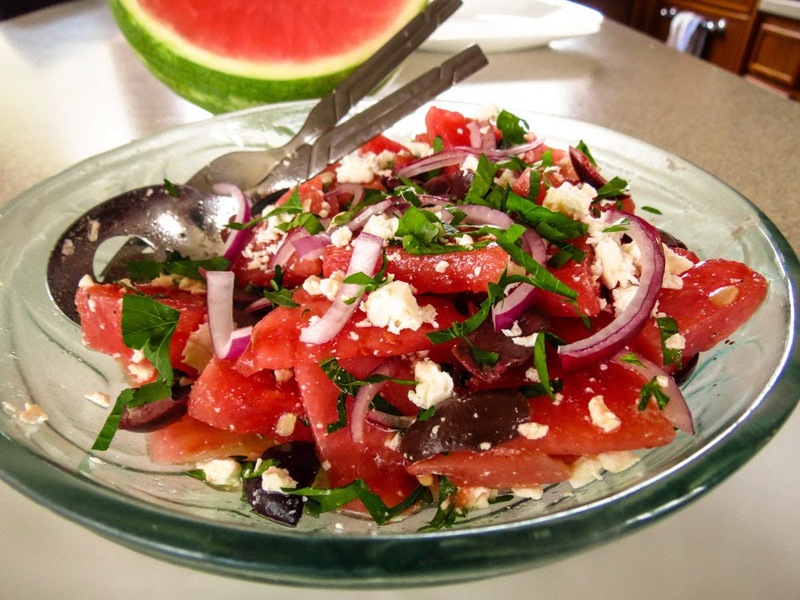 Place the watermelon slices on a rimmed platter or individual serving plates and scatter the onion, parsley, feta cheese and olives (or fruit) over the top. Drizzle the dressing over the top and enjoy this unusual mix. **Note: We found the olives to be too salty & aggressive a flavor; the combination seemed out of balance. In the future I’ll substitute juice-soaked dried cranberries, or in season fresh cherries or strawberries, plus some fresh lemon zest to better highlight the taste of the watermelon. I had a similar experience with a watermelon and feta salad. The first time I had the combination was at a restaurant in Taos, NM. It was so good! I'll have to make yours and see how close they are. Looks delicious!